When the temperature drops, I can never seem to infuse enough moisture into my hair. Static, split ends, the frizzies all end up being everyday occurences. That's why I always look for ways to revitalize my hair. Pureology Colour Care Ambassador Natasha Sunshine offers some simple ways to keep your hair looking great all winter long. 1. Keep a mini bottle of Evian spray in your purse. A light blast of water can help with static or even hat head. Spritz a light mist all over your head from about 12" away, then smooth your flat palms over your hair. 2. Condition, condition, condition. Choose a daily conditioner with extra moisture during the driest months. Plus, a once a week conditioning masque for five minutes will give you that extra dose of hydration your hair needs. 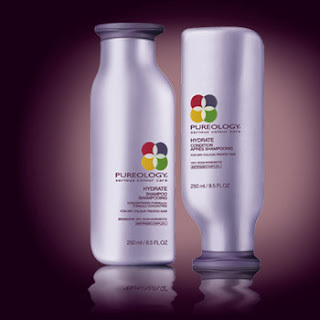 Try Pureology's Hydrate Conditioner and Hydrate HydraWhip Masque. 3. When it comes to styling, be sure to lock in moisture by using a leave-in conditioner and a deeply nourishing styler. Pureology's MiracleFiller is a leave in that will give you a supple dose of protein while hydrating the hair as well. Choose a wet/dry styler like Redken's Argan-6. This incredibly light oil goes on wet and melts over the hair in a protective shine while blowdrying. You can add a couple drops after your style is complete to get extra shine, nourishment and protection. 4. Stay away from too many hot tools. If you're going to blowdry, skip the iron and vice versa. If you opt for the flat or curling iron, go to bed with a wet head and style in the morning. For more information visit www.Pureology.com.